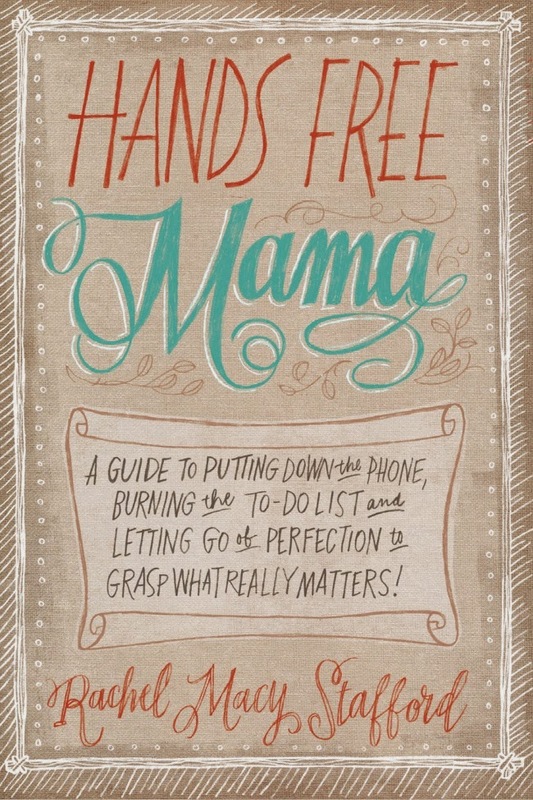 Hands Free Mama : A Guide to Putting Down the Phone, Burning the To-Do List, and Letting Go of Perfection to Grasp What Really Matters!, by Rachel Macy Stafford. I accepted this title for review because I thought it sounded interesting. I thought it sounded like good encouragement to shut down the Facebook account (which I turn on and turn off at random) and pay more attention to the kids than to the screen. While I do not believe that a book written for this express purpose is a necessarily bad idea, I don't think it's an altogether useful one either. The thing of it is, I don't need to read about not living in front of screens, I just need to do it because I know it to be the right thing. Stafford realized that she was spending too much time following the commands of her beeping phone and computer, alerting her to all sorts of irrelevant messages, but all of which were causing her to ignore her real life. She wanted to make a change, turning away from the gadgets and spending quality time with her family and other people she loved. So, she started with a goal of turning off the gadgets for 10 minutes a day. Upon reading that I confess that my righteous self burst out laughing. Then I sighed because I know that there are people on this planet who have their phones and computers beeping at them 24/7. I have always thought that to be deplorably sad. Still, was 10 minutes the big stretch? The world might be worse than I thought. I jest . . . a little. Actually, reading the introduction to the story made me feel pretty good about myself for about 10 seconds. And then I remembered that I have plenty to work on, despite the fact that I do not own a smart phone (Amen) and do not have a texting plan (Hallelujah). Despite the fact that I don't have as many technological distractions as Stafford did, I still have plenty of internal distractions that keep me from being 100% all there with my family. I'm very selfish. I sometimes wish everyone would go away so I can finish reading my book. Except for this one.....my daughter walked up while I was reading it and my only (sarcastic) thought was, "Oh! Well, here ya go! Hands-free practice!" Drop book. Look at daughter. Ding! Ding! I win prizes. If you really want to make a change in how you spend and devote time to your family, I would suggest you start reading scripture for 10 minutes each day (at least) and praying that the Lord will make you the person He wants you to be and your family would need you to be. Transformation through Christ is your best bet and my guess is your pull to the computer screen isn't going to be helped by reading another book about how the computer (or your mobile device of choice) is a distraction. Despite the fact that I didn't much care for this read, I do appreciate Zondervan sending a copy my direction in order to facilitate this review. I received no additional compensation and, should there be any question on this point, all opinions are my own. I've seen so many people get upset about technological distractions and then advocate throwing it all off that I did appreciate that she at least talked about pacing it rather than leaving it. But like Cassandra said, it doesn't seem like it would warrant a whole book. My active mothering of little ones was before we had smart phones and blogs and even computers, and I can testify that there are ALWAYS distractions of some kind and it is a constant struggle to keep the main things the main things. Even books, good as they are, can be a distraction: one of my most humbling memories is getting quite annoyed with my child for interrupting me while I was reading a book on how to be a good mom, and I got the irony and was convicted immediately. Very much agree that we can't change and improve in our own strength. Jonathan was just making fun of me yesterday for randomly deactivating Facebook at times. I try not to get too attached, but it's too easy. I had this book on my wishlist. I was thinking of requesting it for Mother's Day this year. Honestly, I don't know if my opinion would have been the same about it, BUT I very much agree with you. I don't have a smartphone OR texting, either, so I'm a little shocked at the "10 minute" thing. Still, I've found myself annoyed TOO often by my little ones interrupting my reading. What does it mean to be unable to do things in your own strength? I can't stay on Earth and neither does my furniture without God's sustaining gravity, but I don't walk around thinking "I can't avoid floating off into space without God's sustaining gravity." Maybe I should be thinking that. I do have a smart phone and texting (now, finally--just got a hand-me-down iPhone around Christmas). However, I'm more likely to forget I have it when I'm at home and with my kids. What IS a distraction is having wireless at home. Ugh. I've severely limited my FB involvement (which you've probably noticed ;-) ), and just not being mentally engaged there has been good for me. I still get annoyed with my children too often. Sigh. You know this woman has a blog, right? I figure most of the stuff in her book is from her blog, but I could be wrong. Yes, if you read the blog it's KIND Of like reading the book. I like the book better. I don't feel as strongly as Carrie about it, but I am not too far into either. It is something to consider! @Stephanie - Then I'll be interested to hear what you have to say about it. @Taia - I'm not sure I'm TOTALLY clear on the point you are trying to make so I'm refraining from answering directly at the moment. @Amy - Yes, I did notice. :D A good thing! @All - Yes, I did notice that she has a blog. She talks about it a bit in the book. I haven't checked it out (not because I think she's an awful person because I do NOT think THAT!) but just because I haven't. When you say that only strength from the Lord can move you from bad parenting habits to good ones, are you referring to "common grace"? If so, I agree, but don't find it a particularly useful point, kind of like observing that only common grace (in the form of the law of gravity) keeps us anchored on earth's surface. True, but not meaningful to me. @Taia - Oh, ok. While it may be obvious-to-unmeaningful I didn't get the impression it was an obvious in the book. The book reads as if we can make up our minds to do this or that and then we have some mysterious means within ourselves to actually follow through. I CAN'T follow through all on my own gumption (despite my best intentions) because I lose heart so quickly (and sin). The only way I have a hope to be a great mom is if I rely on Christ to provide the wisdom and encouragement and strength, etc., to see me through. If I'm missing something and not understanding what you are trying to say, try me again! I think it's just a difference in how we phrase things and perspective. I thought you were saying "People in general" can't become better parents, etc. without God's strength, not you specifically. It reminds me of people who didn't bother to study organic chemistry commenting that it wasn't God's will that they pass, or me attempting to claim that the reason I can't lose the last 3 lb after twins is that the Holy Spirit keeps shoving junk food in my mouth. I am uncomfortable "blaming" God for failing to give me strength for matters that (in my view) are so obviously due to a lack of self discipline/self control. And I obviously mostly talk to non-Christians. (Why is the yield on the integrated circuits bad, Taia? "It's God's will" would not be the appropriate answer, though technically correct. I don't think it's God's fault if I am a bad parent. I DO think I (or anyone) do have to exert self-control and discipline to make changes. I think all people have a weakness in the self-discipline area in SOME way or another. And I don't believe that I can actually become self-disciplined unless I ask God for help in the matter (in my specific areas in which I lack it). I can make up my mind in these areas but the flesh is weak sort of thing. Not that self-discipline is unattainable but that without Him I'm sort of lost in my own strength (if you will). That makes sense- it's how you see things for yourself, not a statement of how other people should see them. I know lots of non-Christians whose self-discipline I admire. In my view, it's definitely part of "common grace."